Reviewing one of your favourite bands isn't the easiest job. 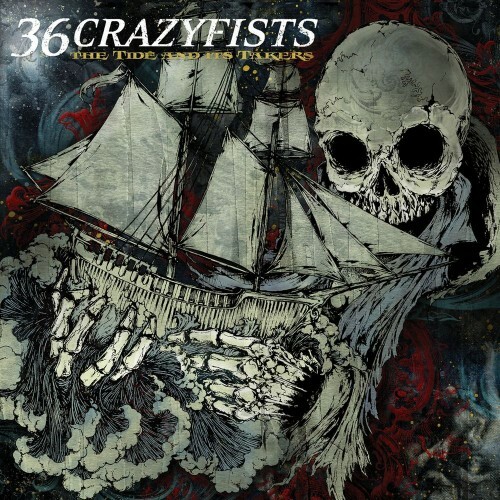 The Alaskan bred posse of 36 Crazyfists has always impressed me with their albums (I gave their second album A Snowcapped Romance a 93/100 and the followup 'Rest Inside the Flames a 85/100). The band signed with Ferret Records after their three Roadrunner Records outings and went hard at work at their fourth full length (not counting their independent release of In the Skin) called 'The Tide And It's Takers', with guitarist Steve Holt in the producer's chair and Andy Sneap signing up for the mixing. When opener 'The All Night Lights' kicks in you instantly know that the band has 'upped the ante': The As I Lay Dying-esque riff is something new for 36CF, and the almost thrashmetal opening of 'Absent Are The Saints' drives the point home. In the vocal department we hear singer Brock Lindow improving on his previous work with more viscious screams and melodic vocals while maintaining his trademark lyrics, often involving introspective moments and various kinds of relationships. Main songwriters of the band Holt & Noonan seemed finally able to play what they want to play, resulting into more complex riffing and some crazy drumparts popping up here and there. So far so good. Continuing the tradition of guest vocals are Candace Kucsulain (Walls of Jericho) on 'Vast and Vague' and Adam Jackson (Twelve Tribes) on 'Clear the Coast'. While both do an admirable job with their respective parts I do have to say that I miss a more dynamic 'guest spot' like the band managed to do on their previous albums with Jonah Jenkins and Raithon Clay. Vocalist Gus Nicklos of the Portland based band The Mediam pops up for some backing vocals on 'Northern November' and 'Only a Year or So', adding some great high end singing. That last song is also my favorite track on the record; starting with an atmospheric piano part which gets build upon by a dialogue between a man and a woman about being seperated (the text comes from two letters from an American soldier in Iraq and his wife), with some typical 36CF-rocking during the chorus. A well done experiment! In the end it comes down to the fact that these guys have made another excellent disc and improving on basically every facet of the band's musicianship and songwriting. To be honest I could do without some of the typical breakdown segments, favouring the more experimental side of this band. But as a fan, I totally dig it, but I can understand that if you never cared for the band that this record won't change that attitude. It's a more thought-out album then Rest Inside The Flames, it's a well crafted record full of 36CF you've grown to love (or hate), but I keep waiting for their 'magnum opus'.